Product prices and availability are accurate as of 2019-04-26 04:49:37 UTC and are subject to change. Any price and availability information displayed on http://www.amazon.com/ at the time of purchase will apply to the purchase of this product. 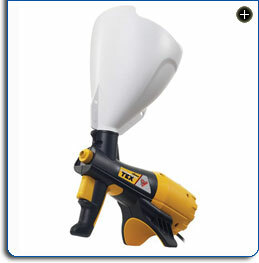 The Wagner Power Tex is an all-in-one powered texture sprayer--no separate air compressor or air hoses needed! It has a built-in turbine with more than enough power to texture an entire ceiling, yet it is simply designed, so it's great for even small touch-up jobs. And because it features Wagner's Lock-n-Go Technology, setup and cleanup are fast and easy with no tools required. 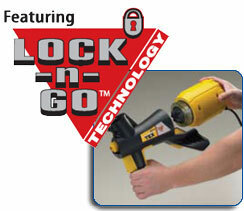 With Lock-n-Go Technology, the sprayer features quick, no-tool assembly. 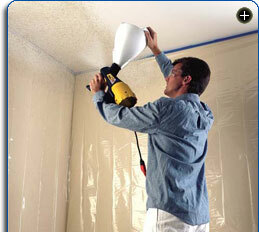 This sprayer's hopper adjusts easily to add attractive texturing to ceilings and walls. 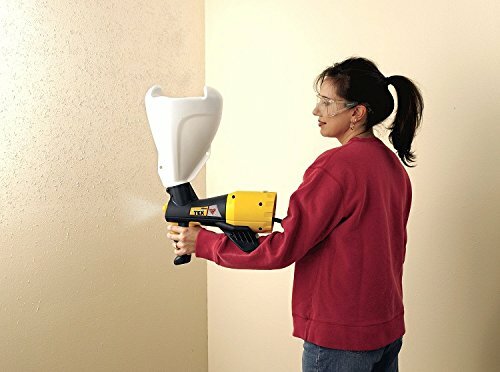 The award-winning Wagner Power Tex texture sprayer features a powerful built-in air turbine that generates enough air flow to spray professional-looking texture on walls, ceilings, and other hard surfaces. Because the turbine is built into the sprayer, there's no air compressor or long air hoses required. The turbine is rated at 120 volts, 3.7 amps, and 60 Hertz. The Wagner Power Tex has received the "Member Tested and Recommended" seal and the "Contractor Tested and Recommended" seal from the Handyman Club of America. 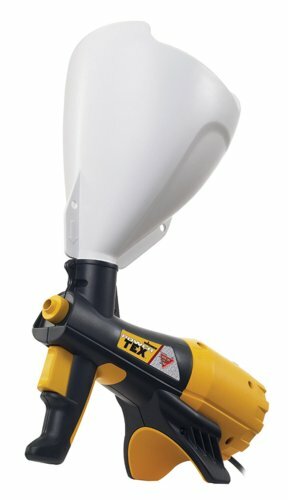 The Power Tex features a large, one-gallon, two-position hopper that can be quickly configured for spraying either ceilings or walls without the need for adapters. 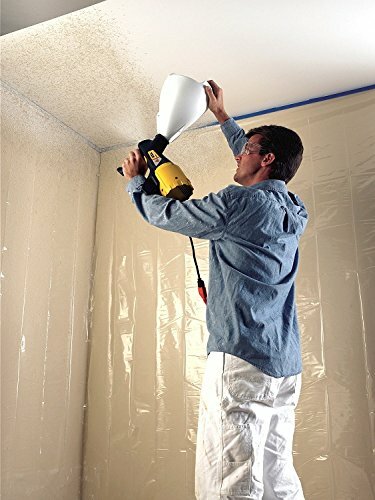 Simply fill the hopper with water-based texture material--the same stuff the pros use--plug the hopper into a standard 15-amp wall socket, and spray. The hopper's three-point stand will stabilize the unit, making filling a snap, and the built-in arm rest will keep you comfortable while you work. 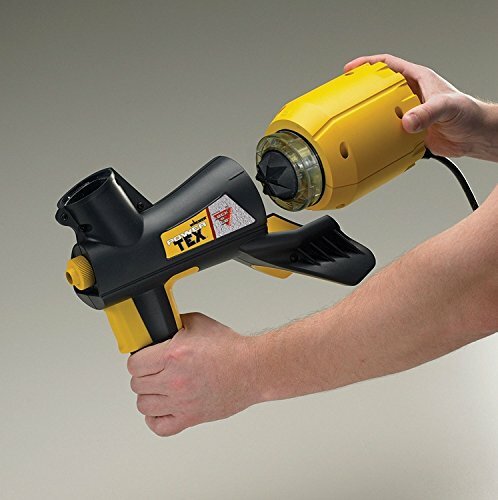 Featuring Wagner's Lock-N-Go Technology, the Power Tex is easy to set up and clean anywhere--no tools required. Assembly takes just minutes: lock the air turbine onto the back of the spray gun with a simple twist and fit the hopper into place on the top of the gun. Screw on the desired nozzle and the Power Tex is ready to go. Cleaning the Power Tex is also a breeze. Simply remove the air turbine, hopper, and nozzle from the spray gun and clean with the included brush and warm, soapy water. Let dry and reassemble the unit for storage--it's that easy! The Wagner Power Tex includes three nozzles (small, medium, and large) and a variable-flow trigger for producing professional-looking textures: Acoustical Popcorn, Knockdown, and Orange Peel finishes. 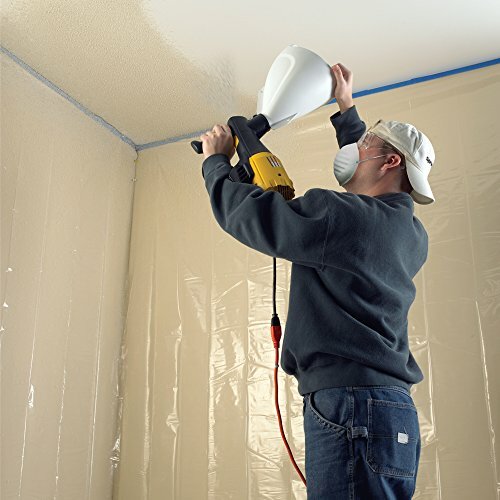 The Power Tex is designed to be used with a wide variety of water-based texture materials, including standard texture material, aggregated texture, unaggregated texture, and diluted joint compound. The Wagner Power Tex is backed by a one-year limited warranty.